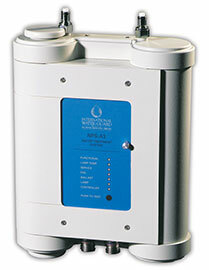 Three words best describe IWG’s patented NPS-A3 potable water treatment unit: small, light and capable. The NPS-A3 occupies very little space (just 12.5” x 9” x 4”) and weighs only 8.2 lbs, yet it supplies 1 US Gallon per minute of potable water that has been filtered and treated to the highest standard. Harmful bacteria, viruses, and protozoa in the water are inactivated by the effects of ultraviolet disinfection, and activated carbon filtration removes suspended solids, as well as heavy metals, volatile organics and chlorine that contribute to objectionable taste and odor. The NPS-A3 also incorporates advanced monitoring functions that can be displayed in the cockpit or cabin to inform flight crew of the unit’s operational status before and during flight, and to provide advance indication of service requirements. A standard installation on Raytheon’s new Hawker Horizon business jet, the NPS-A3 is also installed on all Royal Air Force Nimrod MRA-4 maritime patrol aircraft. Because of its small size, light weight, and powerful water treatment abilities, the NPS-A3 is suitable for virtually any aircraft type with an active onboard water system. View NPS-A3 Unit. Contact us directly to learn more.